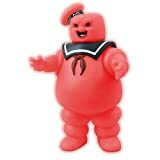 Typically, when a 100 foot tall marshmallow man shows up, there's going to be trouble, but the cool new Ghostbusters Stay Puft Marshmallow Man Bank isn't the chosen destructor, he's just a saver. 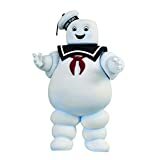 Just drop all your extra loose change into this 8 inch tall vinyl replica of Mr. Stay Puft and you'll be able to save up for a Proton Pack in no time. This innocent, yet monstrous bank is definitely something you don't see everyday.